Could you really? Have you done so? Or is that just speculation? Speculation of course, primarily because differeing results are certinaly within the realm of possibility. Every one is different after all. I wasn't just talking about 180k tests by the way, my query applies to any bitrate. I'm lazy so I wouldn't really bother of course. I only bought it up because one of the things I see people posting here at HA.org all the time is that you have to ABX test for yourself in order to get any truly meaningful results, and that makes perfect sense of course. Thus, any testing I might do is only relevent to me, and is why I feel it would be a waste of time to post such results even if some folks may find said results interesting, though I honestly doubt anyone would actually care all that much. After all, I'm just a nobody and guruboolez is the one with the golden ears which, oddly enough, seem to have attained a strange sort of celebrity status around here, hehe. More power to him too. Like I said, despite what seems like (admitedly very minor) hypocrisy, I have to admit I find the tests fun and interesting to read just like everyone else. Thanks again for all your hard work guru! Again, I hope I have not offended anyone, since that was never my intent. Just find the whole thing rather amusing is all, given what is normally posted whenever someone new comes along and asks "what is the best codec/bitrate?". Basically, other peoples tests *are* helpful because they are an indication. Here's an example: I do know that guru's skills are far above mine(both in terms of training as well as ears). Thus, when listening to classical music i could asume that V3 should be transparent to me most of the time. However, if i will ABX the sample-set myself, then i may find out that even v4 is sufficient for me. Thus, other people's tests to give one an indication...... but for fine-tuning, it is necessary to ABX oneself. Some people may decide to skip the additional time for fine-tuning and instead "encode slightly higher than probably needed" - thus, trading space for time & effort. Speculation of course, primarily because differeing results are certinaly within the realm of possibility. Every one is different after all. Yes but blue is blue for everyone except maybe for daltonic persons. Everyone is different, but the possible profiles are not infinite. And would be the gap between these profiles really important? It's an admirable disinterestedness! I'm sincerly admirative. But this board is a common place for sharing its own experience. When several individual experience are going along the same lines, then it starts to become trustable. Some formats are considered as superior to others: AAC over VQF, MPC over MP3, etc... These affirmations are based on similar individual experience. If everybody would keep their results secret, no knowledge is possible. After all, I'm just a nobody and guruboolez is the one with the golden ears which, oddly enough, seem to have attained a strange sort of celebrity status around here, hehe. More power to him too. Again, I hope I have not offended anyone, since that was never my intent. For me it's OK. You're just questioning the way 'trustable knowledge' of something based on individual experience is possible. Well, it's just epistemology. What can I say? I am extremely happy with Ogg Vorbis! Many thanks to Aoyumi for fixing the problems and maturing Vorbis to such an advanced state that it can even rival the once-dominant MPC. Has anyone told Monty about these results? Monty needs to know!! I have to agree with Guru. Either these artifacts exist or they don't. The level at which various artifacts become bothersome to the individual is the only issue in question (and it's really only significant when dealing with higher bitrates...lower bitrates produce much more noticeable artifacts). Anyone with a golden pair of ears and artifact awareness (such as guru) can make a valid assessment when they blindly compare to the reference, IMO. nice listening test guruboolez great to see the progress that vorbis has made in the last year, and its neat knowing the format still has a great deal of room for future improvements if necessary. He drops in occasionally, but I presume he is busy doing other more important stuff. all the listening tests show to me is a small or substantial improvement in the actual codec. "Best" is whatever is best for your ears and whatever you prefer. Don't forget that most things outside this community are irrelivent (unless websites point here) and unless they actually get merged into the mainline, much like in 1.1.1. It's just too bad their aren't any more developers working on getting multichannel coupling up to snuff, etc or who have the ability to do so. Taming that beast is another esotreric task . Aoyumi work is always greatly appreciated though. I cannot dare to ask Guru, to compare this sample set again between 1.14b and 1.15v to get a ranking of this new multiformat test including not only 1.15v but also 1.14. 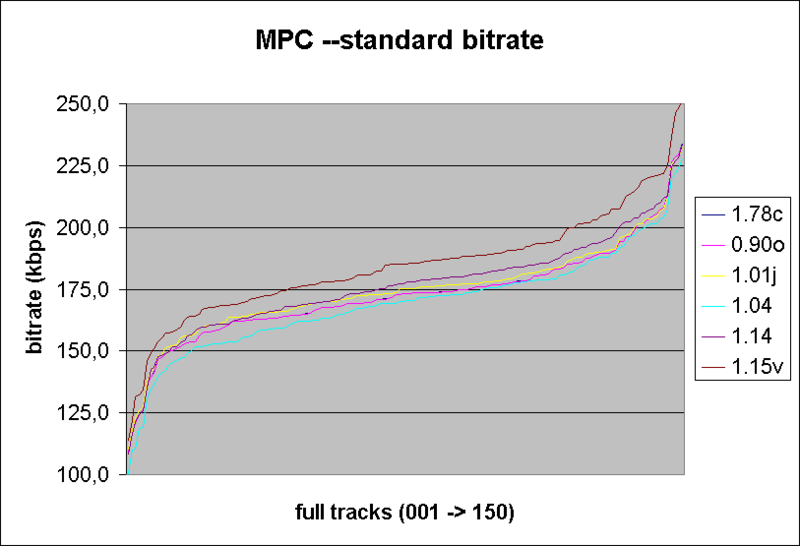 - bitrate consumption: mpc --standard has increased by more than 10 kbps compared to former release of mppenc (I can post a full bitrate table if you want). 1.15 series is by far the version which presents the highest bitrate (not only with classical: people listening different kind of music have confirmed it - but how much is something I can't say). But this inflation is not necessary a problem: some users don't really care about few additionnal kbps, and it could bring higher quality (higher bitrate doesn't necessary mean lower efficiency). -quality (with classical): I'm not sure that 1.15 presents regression compared to 1.14 beta. The problem maybe occur earlier. 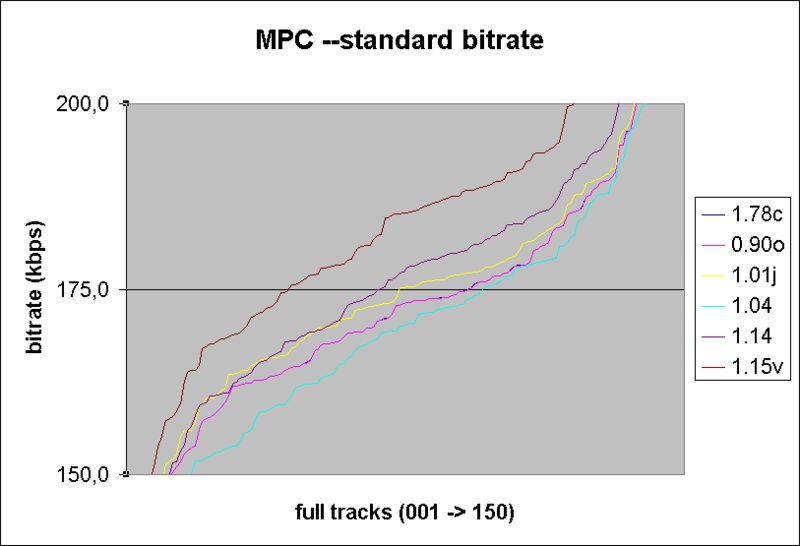 I compared 1.15u to a much older release of mppenc (1.01j) which clearly revealed issues with the latest version of mppenc (+ inflated bitrate). Now I can't tell when exactly the problem happened, or if the quality (with classical) has slowly decreased with version > 1.0 stable. yeah, I know it from posts, I used to use MPC 1.01j once, too. And 1.14 for some time, until I switched to 1.15u,v. The bitrate increase is not only for classic or your impressive 150 samples, but also clearly known, reported here in forum, too, when comparing 1.14 with 1.15r,s,t,u,v. The bitrate increase happens in all genres, classic, jazz, pop, rock, metal probably, too. I agree, that we don't need to discuss the bitrate as such. I am using 1.15 myself, as it improved other problem samples. But I was pointing to the facts, just to make it not forgotten.. If a (the!) trained person tests samples, the results will be more consistent than you carry out a test with a bigger group which includes "deaf" people, who just lower the p-values, who don't add any significance. Of course, primarily you have to say, that this test is primarily valid only for this 1 test-person. But we have some history here, and the reason why Guruboulez tests are very welcomed here, is following: Other persons repeated gurus tests (with or without posting results) and eitehr confirmed them, or admitted, not to hear the difference, but most important: no contradiction. By experience some people here know, that guruboulez results are valid not only to him, but also to other persons, normally worded "made same experience". So, if somebody above tries to play "devils advocate", and questions validity of this test, he should not ridicule himself. The only way to question results is in presenting listening test with opposite/different results. Actually the deaf group adds significance, as the world isn't populated only by golden ears. Probably, change of ATH, noise/tone masking, and noise compander etc. is useful to the improvement of roughness. Magic does not exist there. I was digging through the code before just to try and get a better understanding of how things work? what exactly is noise companding and noise biasing? I mean what specific roles do they play? I understand the ATH and noise/tone masking routines using the FFT and MDCT, but I don't really understand the other two that well. It's my understanding that when you are changing the impulse_noisetune if you are using advanced-command line switch you are actually adjusting the noise bias? Noisebias expresses a frequency noise curve, and noise compand expresses a loudness noise curve. These are bearing the role important for determining a final noise masking value. Moreover, impulse_noisetune operates noisebias of impulse block (short block). some modificitions in the tonality estimation model (which was introduced with 1.15g). If you can't see 1.78c it's simply because 0.90o (my oldest mppenc version) is ultra-close to it. The 1.04 version is by far the most efficient version of mppenc - but remember how much people were frighten about this bitrate drop! Therefore, bitrate started to increase again with 1.06 (not present here). 1.14 is still close to native --standard bitrate (+3,5 kbps on average for my 150 full tracks). 1.15v is now far from what Buschmann 1.78c / Klemm 1.00 encoders used to output. The difference between the extreme is 15 kbps! Does it really justify some gain with a limited set of samples? True, but what user meant is -I suppose- that results of people unable to tell a difference are not really helpful if the purpose of the test is to know how the difference is between these encoders. A lot of 5.0 everywhere are telling us that these encoders are transparent to a lot of people (I guess that there's no need to conduce such tests to confirm that ), but not how different are these encoders. That's why critical listeners could be needed here. Indeed. Deaf users are good to know how formats sound to everybody. But not necessarily how formats sound against each other. Awesome piece of work and information, simply awesome. In short, -streaming 'high' encodings are bit-to-bit identical from aacenc32.dll version 2.9.9.999 (dated from 2004.12.22) to 3.2.0.20! The difference start to appear with 2.9.9.998 dated from 2004.11.27. In other words, no progress in this area since eight months. What happened with Nero Digital team? Have Ivan only worked on SBR and low bitrate stuff during this time? I hope it will encourage other people to perform tests at high bitrates, which have been long considered as out of reach. I'd like to test some metal samples with the same encoders but I'm so short of time in order to do all what I'd like to do. In fact, I've got a lot of time, but too much interesting things to do ! To remarks about statistics : MPC and Vobris seem tied, but the results don't take into account the ABX results, which adds a lot of significance. Maybe if we could analyse all the data, some encoders that look tied wouldn't be so anymore. And I think that Friedemann's method can't be used here, because, if I'm not mistaken, it assumes that no encoder can be tied. I believe that is correct. Friedmann can be used in the case of ties, but some modifications to the calculation of the F-value have to be made, if I remember it correctly. I feel great urge to thank Guruboolez and Aoyumi for their very different, yet so coherent work on Vorbis. The next big thing is aoTuV beta 5 (or will it be the official release, like 1.2 or something? ), which I hope will reduce some ugly noise issues (I can upload a few samples which are ABX-able @ -q5 and, supposedly, -q6). Guru, your tests will always be greatly appreciated by me and my friends. Thank you, again. What I'm trying to say is that, unlike most other genres, classical samples can be very different and so when you have a thorough test like this one, you can get a pretty good overall picture of each codec (encoder). Hey, me too! I've just returned from my vacation, heh. I came to the same conclusion with beta3 using castanets and hihat. Beta2 does a better job at handling pre-echo in these extreme samples. BTW, Guru's graph shows that he used parametric analyses (Fisher's LSD and Tukey's HSD), not a Friedman anlysis. The executable which runs all the analyses is named friedman.exe, though, because the friedman was the first one I wrote. Can you exhibit the log of concrete ABX and HR test? It is more good if there is a detailed comment. In my test range(example - some castanets samples), a result worse than 1.1.0(1) hardly comes out, and, in many cases, the way of beta4 is accepted. Were you tested by beta4 in them? hihat of -q4 and castanets2 of -q6 have improved from beta3. I can mail it to you.